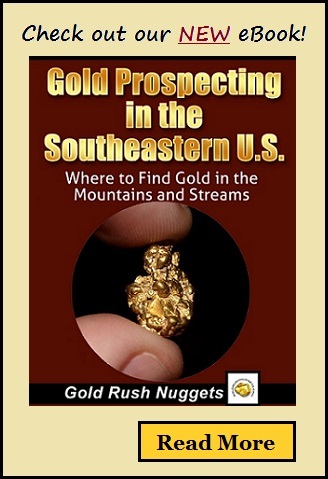 Tennessee has good opportunities for recreational gold prospectors. Although overall production has been very low from this state, gold can be recovered in quantities that will satisfy the recreational gold prospector. Most panning is done in parts in the far southeastern corner of the state, near the towns of Coker Creek and Tellico Plains. The gold belt extends throughout the area near the border of Tennessee and North Carolina. Coker Creek (the creek, not the town) is probably the best known for having gold and is a great place to look. Gold was discovered there in 1831, and a very short lived gold rush occurred. Very quickly the early miners found that the gravels were not rich enough to pay, and excitement was soon redirected to other areas. Original “hotspots” are said to have paid around $2 per day, but the best areas were quickly depleted, not producing enough gold to cause much excitement. Nonetheless, for a recreational prospector out looking to find a bit of “color”, the areas around Coker Creek and Tellico Plains are known gold producers. As with many states with only limited gold production, there are probably many creeks that hold small amounts of gold that are not extensively searched. Exploration in the general vicinity of known gold locations could produce small amounts of placer gold. The vast majority of Tennessee’s gold is going to be very small specks, flakes, and maybe the occasional picker sized nugget. Below are a few additional areas that might be worth investing. Citico, Cane, Turkey and Tobe Creeks in Monroe County. A few streams east of Montvale Springs in Blount County. Several areas in Polk County in the far southeast corner of the state. Most of the waters that flow between the Tellico and Hawassee Rivers have good potential for some gold. Most creeks between Tellico River and Hawassee River have gold. Be aware that at the time of this writing, there is a dredging ban across most of Tennessee. The only areas open for dredging are waters within the Tellico Ranger District in eastern Tennessee, and the GPAA property on Coker Creek. In addition, a permit is required to do any type of prospecting in the state. Be sure to consult with the appropriate agencies to ensure you are within the laws and regulations. Want to learn more about prospecting in the Southeast?